When you access the Analyzer, the system displays that user interface as you last saw it. When you display a pivot table in the Analyzer, the system displays that pivot table as you last saw it. For information on this option, see “Specifying Basic Settings” in Implementing InterSystems Business Intelligence. Note that there is a separate autosave feature for the User Portal. Click the Change button or click the Select Subject Area link. Click the name of the subject area. Pivots  Select this to display any pivot tables defined in this subject area. 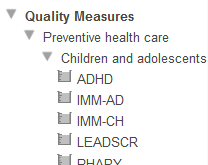 Quality Measures  Select this to display any quality measures available in this subject area. 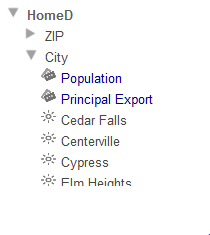 Detail Listings  Select this to display any detail listings defined in this subject area. The main purpose of the Model Content area is to enable you to create pivot tables. To do this, you generally drag and drop items into the Pivot Builder area on the right, as described in the next section. For most items, if you hover the cursor over the name of an item in the Model Content area, the system displays a tooltip that shows the description of the item, if any. 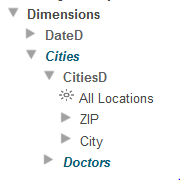 To display a list of dimensions, select Dimensions from the drop-down list in the Model Contents area. Then expand the Dimensions folder. This folder lists the dimensions and the levels, members, and properties that they contain; it might also list related cubes, with their dimensions, levels, and so on. Each dimension also includes at least one hierarchy, which is the actual container for levels. 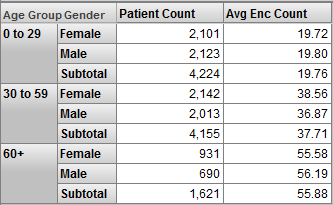 The following shows an example (a modified version of the Patients cube). Here H1 is a hierarchy name. By default, the hierarchy names are not shown unless a dimension contains multiple hierarchies. Alternatively, a dimension can be defined so that its hierarchy names are always shown or never shown. In the Patients cube, each dimension contains only one hierarchy, so the hierarchy names are not shown. Hierarchies are purely informational; you cannot drag and drop them as you can with the other items in the Model Contents pane. In this case, the system does not access the member names until you expand one of these subfolders. Thus it is possible to see and use the properties without waiting for the system to access all the member names. If a level contains 10000 members or more, this area displays only the property names, if any, of the level. The preceding discussion applies only to data levels. In contrast, time levels are always displayed in the same way. Unlike most other elements in the Dimensions section, pivot variables are defined in the Analyzer; see “Defining and Using Pivot Variables,” later in this book. A plug-in contains one or more properties, each of which computes a value. This plug-in contains two properties. Plug-in properties can be used in the same way as measures. A set contains one or more items; typically each item is a member of a level defined elsewhere. Unlike most other elements in the Dimensions section, named filters are defined in the Analyzer; see “Defining Named Filters,” later in this book. Calculated members are typically combinations of other members. For example, the Primary Colors member is a combination of the Red, Yellow, and Blue members of the Favorite Color level. Unlike most other elements in the Dimensions section, calculated members can be defined in the Analyzer; see “Defining Calculated Elements,” later in this book. To use this area, expand folders and needed and click a pivot table name. 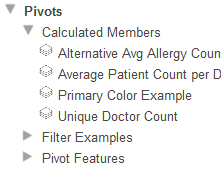 The Pivot Preview area then displays that pivot table. Quality measures can be used in the same way as measures. For information on using this area, see “Displaying a Detail Listing,” later in this book. In the Model Contents pane, select either Dimensions or Quality Measures. Drag and drop items from the Model Contents pane to the Pivot Builder area, as described in the rest of this chapter. Expand DiagD in the Model Contents pane. Or click Diagnoses and then click the plus sign in the header of the Rows box. 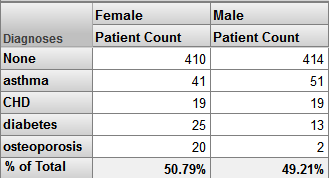 Or click Patient Count and then click the plus sign in the header of the Measures box. 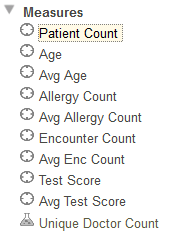 Drag and drop Avg Allergy Count to Measures. Expand AgeD in the Model Contents pane. 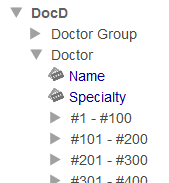 Drag and drop All Patients to Rows, below Diagnoses. 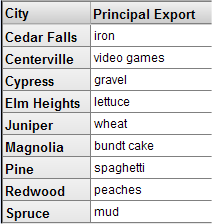 For Pivot Name, specify the name of the pivot table. Also see “Preparing for Folder Item Localization” in Implementing InterSystems Business Intelligence. Note that this complete string is used (along with Folder) as the logical name of the pivot table; the system displays this logical name when you use the Save As option, for example. Folder  Type a folder name or select an existing folder. Note that if you specify a folder name that starts with a single dollar sign, the pivot table definition is accessible only in Studio. 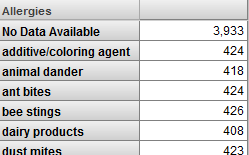 Public  Specifies whether this pivot table is displayed in the User Portal main area. This option does not control access to the pivot table. Access is controlled instead by the Pivot Owner and Access Resource options, discussed later in this list. 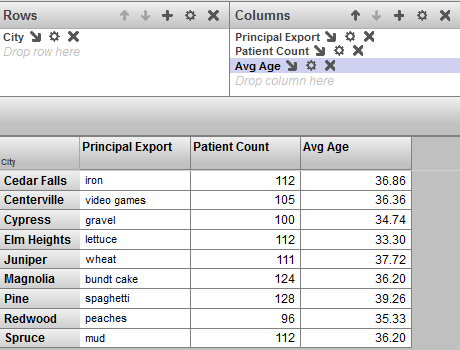 Note that even if the pivot table is not marked as public, you can access it in the Analyzer via Open. Also, you can find it in the User Portal by using the Find option. See the chapter “Introduction to the User Portal” in the Using Dashboards and the User Portal. Locked  Select this check box to temporarily prevent changes to this pivot table. If you select this option, you must clear the Locked check box before any changes can be made to it. Pivot Owner  Optionally specifies the InterSystems IRIS™ user who owns this pivot table. If a pivot table has an owner, then only the owner can specify the Access Resource value for the pivot table; see the next item. Access Resource  Optionally specifies the resource that is used to control access to this pivot table. If you specify this, also specify Pivot Owner. See “Visibility of Folders and Folder Items,” in the chapter “Using the Portal Features” in the Using Dashboards and the User Portal. 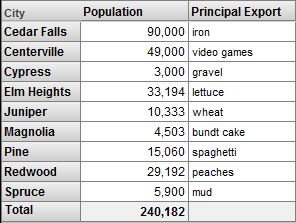 Description  Type a description for this pivot table. Keywords  Type keywords to categorize this pivot table, one keyword (or phrase) per line. These keywords are displayed in the User Portal in List View. Category  Specify the category to which this item belongs. Categories control how the items are grouped in the User Portal in Covers View. To specify the rows of the pivot table, you drag and drop items of items of various types from the Model Contents pane into different areas of the Rows box. This section discusses the items that can be used as rows (and shows samples) and then discusses the details for how to specify the rows. To drag and drop a member, you must click the member name rather than the icon to its left. Note that you can hide the row caption; see “Specifying Pivot Options,” later in this book. This option is especially useful when you drag and drop individual members, because the name of the first member is also used as the caption for the rows, and this is not usually a suitable caption. If there is only one column (as in the case shown here), the data shown for the measure is the aggregate value for that measure across all records (or across all the included records, if the pivot table includes a filter). If the pivot table includes multiple columns that correspond to members, then the data in any column is the value for that measure for that member. If the pivot table includes columns that correspond to measures, the column definition takes precedence and the value shown is determined by the measure used in the column. Note that you can hide the row caption; see “Specifying Pivot Options,” later in this book. This option is especially useful when you drag and drop measures to Rows, because the name of the first measure is also used as the caption for the rows, and this is not usually a suitable caption. Pivot variables (or, more precisely, expression pivot variables). See “Defining and Using Expression Pivot Variables,” later in this book. You can also double-click a level, dimension, member, or named set in the Model Contents pane. If you do, the system removes any items currently in Rows and replaces them with what you double-clicked. If hierarchies are displayed in the Model Contents pane, they are for informational purposes only; you cannot drag and drop them. If you drag and drop onto the bold item label (Age Group in this case), the Analyzer replaces the existing item with the new one. Note that you can hide the row caption; see “Specifying Pivot Options,” later in this book. Notice that now there are two labels called Drop row here. The non-indented one affects the outermost grouping. The indented one affects the inner grouping. When you nest levels this way, the system initially returns only the first 2000 combinations of the levels. If there are more than 2000 rows, the system displays the Show All button at the bottom of the pivot preview area. If you click this button, the system returns all the combinations, and you can page through them. To remove an item from the rows, click the X button to the right of its label in the Rows box. For information on the Advanced Options button , see “Customizing a Pivot Table Items,” later in this book. If you use calculated members for rows, they are always shown after the other members. For the Columns box, you can drag and drop any of the items that you can use for Rows. See the preceding section for information on the items and details on the options. You can drag and drop only measures from the Model Contents pane to Measures. The system does not display more than 100 columns. Within the body of the pivot table, you can instead display one or more measures, quality measures, or plug-in properties, in any combination. Note that you can use measures, quality measures, and plug-in properties (usually just referred to as plug-ins) interchangeably. This section uses the generic term measures to refer to all of these items. Or double-click the measure in the Model Contents pane. Or drag and drop a measure to the Rows box, as discussed earlier. Note that if you display a measure as a row and another measure as a column, the system displays only the value of the measure that is used as a column. Drag and drop the measure to the Measures box The underlying MDX query uses the measure in its filter clause. This means that this pivot table cannot be displayed in a scorecard (on a dashboard). Drag and drop the measure to the Columns box The underlying MDX query uses the measure as a column. This pivot table can be displayed in a scorecard. Rows  Displays the measures as rows. Columns  Displays the measures as columns. This option makes it easier to redefine complex pivot tables, because you can rearrange the Rows box or Columns box and leave the measures alone. If More Than 1 Measure  The system displays the measure name if there is more than one measure, but does not display the name if there is only one measure. Always  The system always displays the measure name. Never  The system never displays the measure name. These options apply only when the pivot table also displays another item on columns, as in the examples shown here. You can transpose a pivot table; that is, switch its rows and columns. To do so, click the Transpose button . Click an item within that box. When you do so, the system enables the applicable buttons in the header of the box. Click the up or down arrows as appropriate. Click an item within that box. Now it is shown with a highlight. Click the Copy button in the top area. Click the destination for this item. Either click another box or click an item in a box. Click to paste the item within the box or after to the selected item. Click to paste the item as a breakout within the selected item. The Analyzer displays the Pivot Options page, which is discussed in detail later in this book. This procedure discusses only the Summary option. Click the Summary check box. Sum  Displays the sum of the values. Count  Displays the count of rows. Max  Displays the maximum of the values. Min  Displays the minimum of the values. Average  Displays the average of the values. % of Total  Displays the sum of the values of this column (or row), as a percentage of the sums of all columns (or rows). For information on overriding how the summary is computed for a given measure, see “Specifying Alternative Aggregation Methods for a Measure,” later in this book. (For summary rows only) Optionally, to cause the summary row to summarize all rows (including rows on later pages), select All Rows from the second drop-down list. 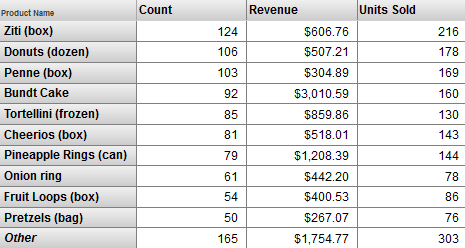 If you display the pivot table as a chart, the chart does not include the summary row or column. If you export to Excel, the summary is included only if it is a sum. An All member represents all records and is typically named something like All Ages or All Categories. Or, as in the example shown here, the All member might have a truly generic name. In contrast to using the pivot options, this approach allows each measure to be aggregated in a different manner. 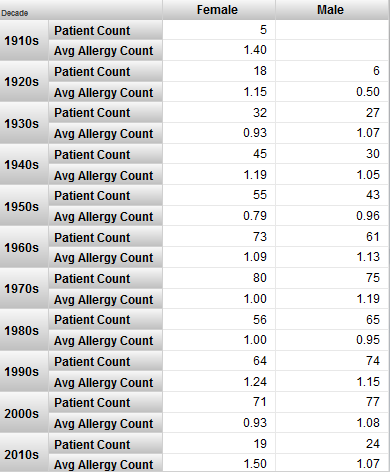 The Patient Count measure is summed, and the Avg Age and Avg Allergy Count measures are averaged. If you do not have any All members, you can always add a custom aggregation; this is also quite simple to do. For clarity, this section describes how to add a summary row as a custom aggregation. The technique is easily adapted for a summary column. For the level used as the rows, add the same level again to the Rows box. Click the Advanced Options button next to the second level in Rows. The Analyzer displays the Advanced Options page, which is discussed in detail later in this book. This procedure discusses only a couple of the options. SUM  For each displayed measure, display the sum of the values for the members. AVG  For each displayed measure, display the average of the values for the members. MIN  For each displayed measure, display the minimum of the values for the members. MAX  For each displayed measure, display the maximum of the values for the members. COUNT  For each displayed measure, display the count of the members. COUNT NONEMPTY  For each displayed measure, display the count of the members that have values in the current context. AGGREGATE  For each displayed measure, display the aggregate value for the members, using the aggregation method defined for that measure. MEDIAN  For each displayed measure, display the median of the values for the members. STDDEV  For each displayed measure, display the standard deviation of the values for the members. VARIANCE  For each displayed measure, display the variance of the values for the members. PERCENTILE  For the given percentile value and for each displayed measure, display the measure value that is at that percentile value. For this option, you can specify a percentile value in the Percentile field; the default is 50. Optionally type a new caption into Caption. The default caption is the name of the function. When you use this option, the system first uses any other settings you specified on this dialog box. The Analyzer provides an easy way to display the top 80% of a set (considering the count measure by default), and to group the bottom 20% into a single unit, as in the following example. Click the Advanced Options button in the Rows or Columns box. Then select a measure and select Ascending or Descending. By default, the 80/20 suppression option first sorts the members in descending order by count. Use Sort Members to specify a different sort order. To modify the query to use different percentages, see the section “Modifying Details of the 80/20 Suppression Option,” later in this book. If the autosave feature for the Analyzer is enabled, then when you display a pivot table, the Analyzer displays that pivot table with any unsaved changes that you might have made in the Analyzer. To remove these unsaved changes, click Restore. Then the Analyzer displays the pivot table as defined in its saved definition. Or save the pivot table, thus saving the changes and changing the definition. See the next topic. Click Save. The Analyzer saves the pivot table immediately, if you have specified a name for it; otherwise, the Analyzer prompts you as if you had selected Menu > Save With Options. Click Menu > Save. The Analyzer saves the pivot table immediately, if you have specified a name for it; otherwise, the Analyzer prompts you as if you had selected Menu > Save With Options. If you specify a new folder or a new name, the Analyzer creates a copy of the original pivot table and saves it to this new name. If the pivot table already exists, the system prompts you for confirmation that you want to overwrite it. 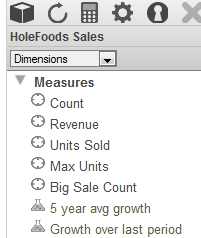 Or click Save As to make a copy of the pivot table. The Analyzer prompts you for a new name.